Children are naturally curious, and through the Kagaku Asobi Lab program we hope that we can stimulate a lasting interest in science. 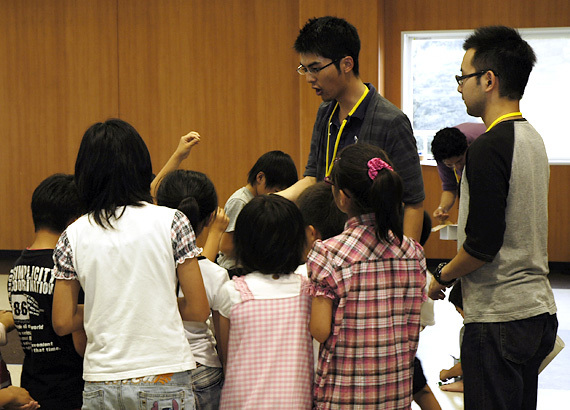 Take a handful of enthusiastic university students, an interesting topic on everyday science, and a group of eager children, mix them all together and you have Kagaku Asobi Lab, a fun-filled children’s science workshop to introduce the wonders of science. The latest Kagaku Asobi Lab, only the second of its kind, was held on June 23, 2010 at an after school care center in Tsukuba city. Children were shown how seeds of some trees disperse on the wind, and that the way they fly or float depends on their shape. After a short introduction and video, children made ? their own colorful model seeds from paper and paperclips, and had fun watching them fly. They even experimented with some new shapes of their own design. Kagaku Asobi Lab children’s science workshops are organized and performed by the volunteer science communication group SCOUT (Science Communication of the University of Tsukuba). Beginning in May 2010, Kagaku Asobi Lab has been held just two times, but has already delighted over 100 children by opening their eyes to the science in the world around them. Over the summer, Kagaku Asobi Lab will be appearing at Tsukuba’s La La Garden shopping center with the themes of ‘The Ocean’ on July 17, and ‘Insects’ on August 29. Further events will be planned at other locations from September. Founding member Yoshimi Ojima said ‘Children are naturally curious, and through the Kagaku Asobi Lab program we hope that we can stimulate a lasting interest in science’.